As the results indicate, 41% of registered Asian American voters indicated that they would vote for someone else, while 37% said they would stick with their candidate, and 22% said they didn’t know. These results were similar across detailed Asian subgroups, with two notable exceptions: Korean Americans were more likely than the Asian American average to say that they would vote for someone else, while Vietnamese American voters largely said that they would stick with their candidate. 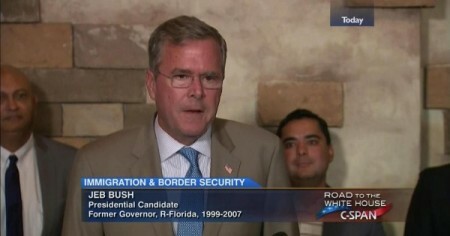 There were significant differences by party identification. 49% of those who identified as Democrat (or leaned that way) said they would switch their vote, while 32% of Republican identifiers and leaners said they would do so. Among those who said they did not identify with either party, 35% said they would vote for someone else. 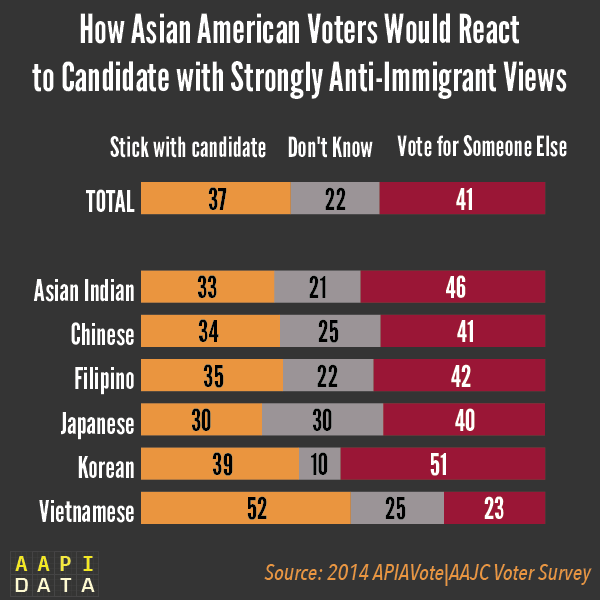 Survey respondents were asked about anti-immigrant views, and not anti-Asian views in particular. Thus, it is possible that the results would be even stronger in the current political primary context than in prior political contexts with more general anti-immigrant rhetoric. Survey respondents were asked a similar question about candidates who express strong views about Christian values: If a political candidate expressed strong views about Christian values, and you agreed with him or her on other issues, would you still vote for that candidate, or would you vote for someone else? Only 28% said they would vote for another candidate, while 54% said they would still vote for their candidate, and 18% said that they didn’t know.